Introducing the 2019 Husqvarna Demo Line Up at Babes in the Dirt 5! We are thrilled to announce we will be releasing the 2019 Husqvarna demo next week but wanted to give you a sneak peak on what the Husky crew is bringing out for you to joy ride…. This year at Babes in the Dirt 5, Husqvarna Motorcycles will bring 20 demo motorcycles for beginner, new, and experienced riders. Beginning with the small displacement bikes, best for those “New to Moto,” we have four 2019 TC 85‘s. From there, the bikes go up in engine size and seat height. Read on for a brief overview bikes that will be available at this event and visit www.husqvarna-motorcycles.com for full model range and technical specifications. The 2019 FE 250 will comprise much of the demo fleet at Babes in the Dirt 5. FE models are dual-sport motorcycles, which are capable off-road bikes that are plated and ready for the road. The engines are second to none in terms of overall performance and versatility, making the bike accessible to both novice and experienced riders. These models will be lowered by shortening the Rear Shock 50 mm, which lowers the seat height from 37.7 inches to roughly 35 inches. The forks are also lowered 50 mm balancing out the front and rear of the bike. Featuring seven updated models and an all-new motocross line, Husqvarna Motorcycles 2019 motocross range combines cutting-edge technology with high-end componentry to offer riders of all ages and riding levels one of the most efficient and sophisticated motocross line ups on the market. The 2019 TC 85 17/14 is our standard size 85 cc, meaning the wheel size is standard with a 17’’ front wheel and 14’’ rear wheel. This is a great beginner motocross bike with a low seat height of 33.5 inches. A lower seat height gives a new rider the necessary confidence to feel comfortable while riding and stopping. The 2019 TC 85 19/16 is our big wheel 85 cc, this bike has the same engine as our standard size 85 cc but with larger wheels. A 19’’ front wheel and a 16’’ rear wheel offer a slightly taller seat height of 34.8 inches. The 2019 TC 125 is a standard size Motocross bike with a 21’’ front wheel and a 19’’ rear wheel. This bike is the natural progression for a rider who is outgrowing their 85 cc and wants something bigger but with a minimal jump in power; perfect for those who are still gaining confidence in the dirt. The 2019 FC 250 is a standard size Motocross bike and raced by Rockstar Energy Husqvarna Factory Racing team riders Michael Mosiman, Thomas Covington and Jordan Bailey in the 250 class. It features a 21’’ front wheel and a 19’’ rear wheel. These models will be lowered by shortening the Rear Shock 12 mm, which lowers the seat height from 37.4 inches to roughly 36 inches. The forks are then raised in the triple clamps balancing out the front and rear of the bike. 2019 FC 350 is a standard size Motocross race bike with a 21’’ front wheel and a 19’’ rear wheel. These bikes will be available for demo at the stock seat height of 37.4 inches. 2019 FC 450 is a standard size Motocross bike, the same bike Husqvarna Rockstar Energy Husqvarna Factory Race Team riders Jason Anderson, Dean Wilson and Zach Osborne ride in the 450 class for Motocross and Supercross. The FC 450 features a 21’’ front wheel and a 19’’ rear wheel. This bike will be available for demo at the seat stock height of 37.4 inches and should only be ridden by the most experienced riders. Meet Adrienne Hunt @SLOdirtgirl ! After ripping the demo bikes at Babes in the Dirt she decided to get herself a brand new Husqvarna FE 250. We got to catch up with her to hear more about her life on two wheels and why calls the FE 250 her dream bike. I started riding mountain bikes in 2012 after losing a bunch of weight, as I needed something to keep me busy after I gave up all the glory and retired from couch surfing. I really got into riding and I did a few downhill and XC races for fun but then started to get involved in other hobbies, so riding took a back seat for several years. I started missing the adrenaline and physicality of it, but I also had an aversion to big climbs, enter the dirt bike. My fiancé had been riding dirt bikes since we met but it was only until June of 2017 that I was like, it’s time for me to check this out and get up these hills by a twist of the throttle. I’ve been riding and falling in the dirt for about 1 ½ years now. I thought that after riding mountain bikes that dirt biking would come naturally for me, it did not, and I learned humility quickly. I had many crashes and made many mistakes when I first started riding but stuck it out, despite a few trail side meltdowns, some tears of frustration and even a few self-deprecating comments here and there, I’ve learned to stick it out and could not be happier with my progression however fast or slow it comes now. As you can tell I am super serious person but truly, my favorite part is the progression. I enjoy seeing myself progress and get so pumped when I see other riders and their progression. It is one of the many things that I love about it. Seeing a trail or a section that you said “nope” to and then being able to take it on or seeing your buddy do the same. So cool! I have made so many new friends and people I consider “family” while riding, I could not be more grateful. I like to throw together impromptu, all inclusive (male/female/squirrel) group rides or little campouts every now and then. I find that this is a great way to have people get together who may not have otherwise met up. It is so fun to see a rider meet another rider who is close to them and see them get all stoked to have someone to ride with near them. I truly have a good time whenever I am in the dirt so whether it is “going all out” for me or helping newer riders, I love it all. In 2008 I bought a 1986 Honda Nighthawk 750 and within a few weeks, hit sand in an apex, laid it down and was hospitalized for a few weeks. My family wanted me to take a break from riding, so I respected that. In 2016, things changed and I was able to purchase a Kawasaki Versys with the intent to ADV it out and do some Dual-sport rides. After some fun adventures and mishaps I decided that I wanted something a little more dirt worthy, so I sold the Versys and bought my first dirt bike in May of 2017 which was my 1993 XR250r. We just bought my dream bike, a 2018 Husqvarna FE250 and I could not be more excited for the adventures to come. My first ride on her was just this Christmas at Hungry Valley OHV. We had set up one of those impromptu campouts and I was stoked to get on that maiden dirt voyage. As I confidently threw my leg over my new steed, I put her in first, let out the clutch and promptly stalled it and did a slow-motion fall to the ground. As we set out on the group ride I knew that I felt very uncomfortable on the bike and I felt I was going to hurt myself if I tried to keep up but didn’t know the bike yet, so I broke off from the group for a few hours and just did my own thing. No pressure, no audience, just me, my bike and my own thoughts. After that I was able to ride with more confidence and a lot less of a death grip. 2019 Husqvarna 701. We would love to be able to travel more by two wheels and check off some bucket list items. Having something a bit more street orientated with some off-road capabilities would help get some of that list knocked out. I was able to log some solid hours on the FE250 at Babes in the dirt last year. I think you could equate it to a groupie who just lingers near the bands dressing room, that was me at the Husqvarna demo booth (Hi Allison, it’s USAdrienne!) After taking it out for several rides, I was hooked. The throttle response, the suspension, right out of the gate it felt like a bike that met my current skill level but would also allow me to level up. The best part is it rides like a track bike but is plated for the times I do hit a dual sport ride or need to get from trail to trail. It also comes down to how I was treated by Husqvarna and how they support riders especially us women. I was treated like I was family from the moment I skipped up the husky booth with childlike glee. They were great with the barrage of questions I had for them and when they had demos going out but had a bike that was not getting ridden, they allowed me to join the demo ride again. We live at least 3 hours from the closest dealer, so I had to call several places to get quotes and talk about what I needed as a rider and what I was willing to spend. Honestly, I was a bit disappointed with a few of the shops I reached out to as there was a lack of willingness to help someone who had to drive to see their product. I get cash in hand talks, but I was talked down to by some dealers or they would not deal with me over the phone at all. I was able to speak with Victor from HYR in Redlands and they were amazing to work with and gave me a great deal on the moto. For us, pulling the trailer, it was over a 5hr drive but it was worth the drive knowing I was being taken care of and my money was going to a shop that seemed to treat everyone with respect. Isn't any terrain the best terrain on a dirt bike?! To narrow it down, I really enjoy technical terrain, however you categorize that. It could be the single track that is sloughing away to a steep drop and you keep telling yourself “keep your eyes ahead...” The chunky rock section that has you working that clutch and picking your lines just so, or the steep, rutted, loose hill climb that has you sitting at the bottom of it for a few seconds, trying to pump yourself up for what is to come. I like any terrain that challenges me and helps me progress. I thoroughly enjoy but am not great at rocky enduro type terrain. I find keeping the momentum through the chunk can be difficult or I’ll get in my own head and start to think too much about a rock coming up in my path and grab a fist of brake. At the same time, I love the feeling of being in control yet on the verge of being bucked off. Lots of clutch control to work on for me but again, that is why I love the braap so much, you generally can grow as a rider, as much as you are willing to push yourself. A month or two into first starting to ride, I was all about enduro. @Crystal_loves_moto this, @Megs_braap that. I was determined to Jarvis off and do my own thing one day, so the fiancé and I went to Ballinger Canyon and I was just going to “explore” and putt-putt around for a “chill ride.” So we went our separate ways and I went to explore this little area I had eyed before that had a dry little creek bed next to it. As I explored, I thought in all my wisdom, what a great place to practice these enduro skills that I have mastered in all my two months of riding and watching videos. I rode to the creek bed thinking I’ll drop in there and play around these rocks, it is narrow but passable. It is about a 4ft drop into the bed and as I started to drop in, I got a better visual of where I thought I could exit out of and realized, it was impassable and... the front wheel goes down. I looked back up to where I came from and there was no way I was getting it back up, so I had to forge on. With the bike being flooded and the kickstand sinking in when I tried to kick it over, I struggled for over an hour to get the bike to start in the mid-day August heat. It ended up being so sandy and deep that I dug my wheel in many times. With getting stuck several times and stalling the bike, the 1 hour or so adventure turned into a 3-hour knock-down, drag out fight with the terrain and my bike. When I got back to camp the fiancé asked how many miles I got in and I think I pulled a whopping 0.75 miles that day but many lessons learned. Hollister Hills OHV ranks pretty high on the list for several reasons. It combines two of my favorite things camping and dirt bikes. The park really offers a new rider a variety of terrain in a more controlled setting and for me that was really helpful to focus on my riding more than worrying about traffic coming at me at times, as Hollister has many one-way trails. One of my favorite areas there is the enduro course and the trials course. From my first visit there I eyed this big tire in the enduro course and a log drop at the trials course. I kept telling myself you are going to hit those one day and with knees shaking and heart punding, one visit I mustered the mental strength to do it. The first attempt on the tire, not bad, I made it, hit the throttle a bit too much at the top and front wheel lifted a bit, it made the landing a bit sketchy but I pulled it off. I thought, lets’ do it again, get better at it! I approached it and just as I was about to go over my brain went weird, I got scared and I just rolled off the throttle and stalled at the top and toppled over. Bike upside down, oil dripping down the frame, there was only one thing to do, take a picture. There are a few goal trails there as well that I want to ride now that I have the Husky like Troll trail but the poison oak factor makes me wonder how worth it the trail is, when I get exposed to that evil leaf, it is no joke. I also fell in love with Kennedy Meadows my one time there. I wish I could build a little homestead and live there fulltime. The place for me, has been the best overall riding and camping experience for me, it is just so gorgeous. The trees and meadows, the creeks, the wildlife; Kennedy Meadows just meets every expectation for me when it comes to combining my love of nature, camping and dirt bike riding. The trails vary quite a bit but unless you are an adventurous beginner, it has some fairly technical terrain. I was really able to surprise myself there and made it through many spots that myself and others were standing by waiting for the topple. I really look forward to getting back out there in 2019. Big Bear, Forest Hill Trail 6, B.C area, Moab, Sawtooth mountains, Tillamook area, race the Donner Hare scramble and many more. I have a really solid set of ladies that I have a great time riding with, they live 3-4hours away from me but we seem to find the time to meet up and ride together every few months or so. It goes back to how supportive it can be riding with other women and the growth and bonding you all develop over it. I am able to be a small part of a bigger picture in many ways as a female rider and I really enjoy trying to foster those relationships with other female riders. I enjoy going fast and getting out of my comfort zone but at 36, I have nothing to prove, other than something to myself. With that being said, I really enjoy riding with new riders whether leading or sweeping with a group or just going out to have a good time. I like to see how they learn and if I am lucky to ride with them down the road, to see how much they have progressed. I think some of us ladies, and I am guilty of it, get in our own heads and think we are holding up a group or you don't want to be the “liability person,” You're not, ride your own ride, progress at your own pace. The bummer thing is I don’t really have anyone that I ride with locally, it would be really nice to rip around with some ladies but they are few and far between, if you know of any that want to ride, send them my way! I look up to so many riders for many different reasons and wish I could list them all but certainly my friend Avila (@avy119). I met her and her husband at one of the random rides we threw together at Hungry Valley. She is a blast to ride with, is willing to try any trail and gets through it with a smile. My friend CJ (@radical_budhist) also comes to mind. She is someone who I have had the pleasure of watching progress so much since we first started riding together. She was another gal I met through one of those impromptu campouts up at Hollister Hills when we both were pros on fire roads. She is always in a rad mood, keeping the group smiling and willing to push her comfort zone. We all share so many “woohoos!” on our rides. I look up to all the ladies of the dirt world who are making it happen; @Babesinthedirt and all you have put into this, it has changed my life as rider. Babes has exposed me to opportunities and people I may have never met otherwise. The @dirt_ladies group and what we are trying to do with getting more women riding together and being able to connect with one another. Last but not least, my fiancé. He has been my number one fan from day one. Always supportive of my riding. Has helped celebrate triumphs, listened to my frustrations and always makes sure that the bike keeps running so we could do it all over again. There is no one I would rather have as my road dog in life. I rolled in early Friday and helped volunteer for the morning until my afternoon Husqvarna demo. I was so excited to try a new bike but super nervous as well. The demo was well paced, everyone had everyone's back and the Husqvarna crew made sure that you were taken care of and had a good time. I was able to meet many of the gals I follow on Instagram and that was so neat to put faces to the names and even ride with a few. That night I made my rounds to the many trailers, tents and car campers that I wanted to say hi to. It felt like there was not enough time in this day, I wanted it to go on but sleep was needed so I reluctantly wandered back to camp for some Zzz’s. Saturday had lots of opportunities, and it was hard to choose which to do; a Husqvarna demo, ride trail or track in the park with friends, play games at the various booths, check out the cool gear at the Fox Women’s booth or just get to know these ladies who you may only get to see once a year. Some of the dirt ladies set up a small beginner’s ride for a few ladies and we had a great time watching these gals really come out of their comfort zone and own the trails. I think that is one of the biggest things I think a lot of ladies can get out of female only events, you get a different support system, you learn that you are doing okay and that many other ladies are in the same boat. You meet ladies that are rippers but just want to support another rider and are just stoked to see you out on the trail. You also meet newer riders and you bond over the same triumphs and experiences. Saturday night consisted of merriment and karaoke. I may or may not have had a great time embarrassing myself while singing Macklemore’s “Thrift shop” while coming down with a cold. Sunday was time to say our “See you next years.” We shook the weekends sand off and helped each other load up and prepare for our various distances home. Before leaving I was able to take Brian Garrahan’s group training that afternoon and he made that was such a fun experience. I went into the class thinking I knew a fair amount of the basics for riding but found many techniques that could improve my riding or ways to refine what I was already doing but make it safer and in turn, riding into more fun. Just be you. We all get into riding dirt for different reasons and throughout your whole moto journey you will be exposed to different types of riders and types of riding but as long as you are true to the reason you ride, the ride will always be fun and always be yours. It is easy to get into your own head, to think maybe you are not improving enough or when you are riding with people that you are the one, “keeping them back,” you are not. It may not happen overnight but you will find your “people.” The ones you look up to and the ones that look up to you. The ones that keep pushing you to do more because they know you can and the ones that will help push your bike back up the hill when maybe it did not all go to plan. Riding is an adventure and all adventures have ups and downs, just remember, you are doing this for you and no one else, when that is the motivation that is when it really becomes fun. A big thanks to all the ladies and men behind the scenes who are supportive in getting more women riding and having fun in the dirt. Instagram groups like @Dualsportwomen , @WLFenduro, @National_Forest_Riders (NFR) and @Corva are all doing things to help support all riders and our riding community. Husqvarna motorcycles are at the forefront of highlighting this movement of women riders and putting their money where their mouth is. Fox Womens with their support and proactiveness with their female riding audience’s needs and wants as riders. And of course, to ALL who have supported me through this journey of mine. It has been such a fun and wild ride since I started riding a year and some change ago. When I joined Instagram, I wanted to try and find more women to ride with and to highlight the struggles and triumphs of someone my age, who just started getting into riding a dirt bike. I have made so many friends and have been able to follow along with so many adventures of others. I look forward to many more years making a fool….er…improving my skills as a rider and look forward to enjoying that journey with others as well. Cheers to #2019yearofthebraap. We are proud to support The Ladies Ride and Social is a Trail Ride & Social Event for women in the Limerick Forest, near Brockville Ontario. This one day event is designed for ladies to have fun on the trails and to meet other like minded riders in a relaxed atmosphere. This event is spearheaded by Sascha Lange, Women’s Advocate Bytown Motorcycle Association, and Co-Producer- Ladies Limerick Ride and Social. Tell us about Bytown Motorcycle Association (BMA) and what the organization does? We are a group of novice to expert off-road and dual sport riders who love the dirt. We work hard to develop, maintain, and sustain the off-road trail networks here in Eastern Ontario. Our club hosts a variety of events and activities throughout the year. The Ladies Ride and Social started in 2016 as a joint event between the Bytown Motorcycle Association and Husqvarna Motorcycles Canada. The goal for the Ladies Ride and Social is to engage women riders and to grow participation by creating an inviting atmosphere that encourages women to join group rides, socialize with other women and to find new riding buddies. We welcome new riders to try a motorcycle for the first time and experienced BMA women to lead groups through their favorite trails. The key for this event is to make the barrier for participation as minimal as possible by hosting rides for all skill levels and by having a dedicated area to practice finer skills. The event is also free! We create a welcoming environment with a lounge area where riders (and their friends and families) can mingle. A complimentary BBQ lunch and treats are provided to all ladies and girl participants.The day concludes with a huge prize giveaway where everyone will be a winner! What is the riding like in and around the Limerick Forest? The Limerick forest has a mix of double track and single-track trails. Limerick is a shared use forest. Doubletrack is shared with ATV’s and side by sides and single-track is shared with horses, mountain bikers and hikers. The doubletrack trails are a great way to start off-road riding. 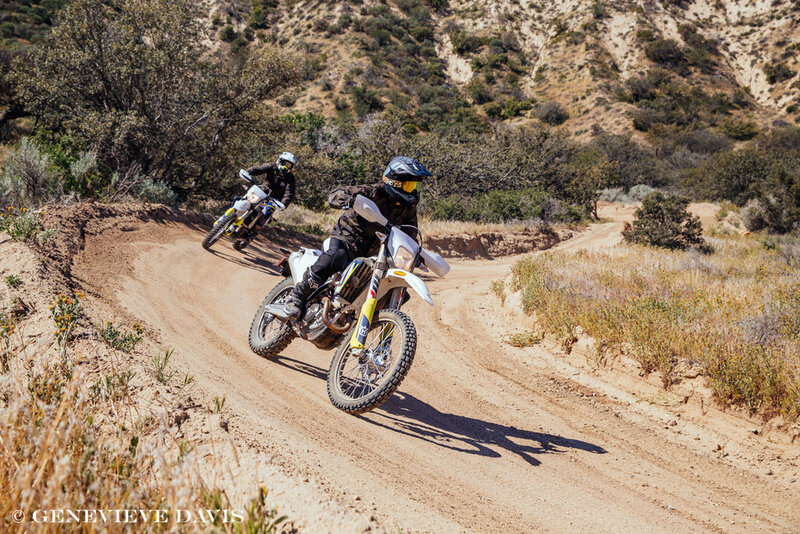 The single-track trails are purposely built as motorcycle trails and as practice trails for enduro. Single-track trails offer twisty turns, hills, sand and roots. Limerick isn’t very rocky like many other riding areas. The routes in Limerick forest are numbered very clearly as there are many loops around the 2 main parking areas. Connecting the various loops can make for a nice long ride. It’s also convenient to ride back into the gravel pit for breaks and to have some drinks and snacks before continuing your ride. Overall, the Limerick Forest is a super fun and appealing area with lots of accessible single track. It is important for us to note that we promote the respectful use of the forest so the different groups can continue to co-exist on the trails. What should ladies expect this year? · Prizes for all women and girls! Participation is free for ladies and girls! Husqvarna Motorcycles in Canada has partnered with the BMA organization and their Ladies Ride and Social event for a few years now, tell us about the relationship and what happens on site. We have the co-organization of this even dialed. The Husqvarna Motorcycles team provides a nice range of bikes for ladies to try out on the trails or in the skills area. They also amp up the event by creating the lounge area, arrange for special guests and a ton of really cool prizes. The BMA’s volunteers lead the group rides, setup the skills area and practical things like registration and parking. Jointly we cover the things that make this event a real social, from the lounge to the food. How do we sign up! ?